The plane arrived here in Manila at 1:35PM last 25th of March, it's my second vacation since I started working in Singapore. After I gave my "pasalubongs" and made some "kumustahans" with my family, I immediately went to a barber shop because I need a haircut. 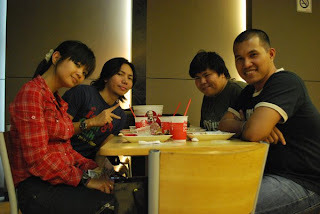 Then I went to SM Megamall to meet Breastfriend, Obesefriend and Bestfriend. The meeting point was in KFC. Breastfriend treated us a bucket meal as a post birthday treat (she celebrated her birthday on the 15th of March). It was also a chance seeing my bestfriend again and he was looking happy and fine. 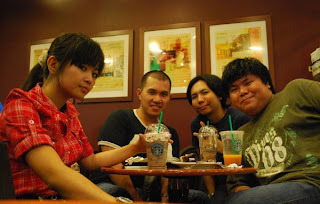 As usual, Wendel (obesefriend) was late and we had this story sharing and updates to our lives. We then headed to Starbucks to get some coffee and it was a treat from Wendel as a pre birthday treat as I will not be around on the 14th of April to celebrate with him. I ordered my favorite flavor which is Green Tea and Wendel also provided a slice of cake (so kuripot) for the candle blowing. In overall, it was a nice moment seeing again your good friends and spending time with them. I think we had a lot of discussions and "tsikahans" as we lasted almost 12 and I felt really tired and sleepy as I only had one hour of sleep that day.